Wholesale , Business to Business or Drop Ship account? Wholesale account - You have a brick and mortar store and want to stock and sell our furniture in your store. Business to Business account - Restaurants, Bars, Interior Designers or store wanting to display our furniture or use for business purposes only. Drop Ship account - Store only showing our furniture and taking orders for drop ship to customers or catalog company. If you have any questions you can contact us by clicking on the "contact us" at top of this page! If you are looking for personal purchase, please click on the "Find a Store" link below under Customer Service to see if there is a retailer near you. 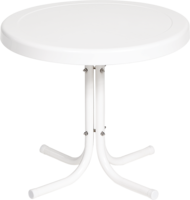 We would like for you to purchase from one of our retailers but if you can't find one near you, you can go to: Retro Metal Chairs to place an order on-line. Thanks for your interest in our Retro Metal Furniture! 1950s style metal lawn furniture. Due to the quality of our products and the wide variety of colors and design, our furniture will enhance any decor. 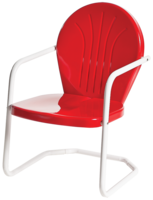 Powder Coating finish extends the life of the furniture, making it more resistant to rust, chips and fading while exposed to the outdoor elements. Heavy duty frames, stainless steel fasteners and high gloss coat all add up to a traditional value your grandparents would be proud of. Our pledge is to offer personal service along with our great values. Your satisfaction is important to us and your feedback would be greatly appreciated. The furniture is made in China with our molds and tooling. Everything we sell is made to our specifications. The Torrans Manufacturing Company name is our guarantee! Torrans Manufacturing Company is owned and operated by Louis and Kathy Torrans in Jefferson, Texas. Shingles and crystal ware are long gone from the company catalog. 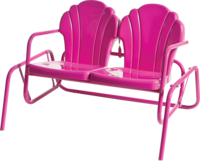 In fact, we make just one kind of item, classic and traditional metal outdoor furniture of the type we all grew up with. These timeless designs are again available in a large array of colors and styles. Torrans Manufacturing produces vintage correct stamped steel furniture to the same and in most instances better standards than many of the past manufacturers. Our furniture is not simple retro knockoffs made to look like the antique originals but are instead faithful continuations with only minor superficial changes. Parts used on our chairs and gliders directly exchange with many vintage examples. So much so that providing hardware, frames and other parts to people restoring antique pieces is now a growing part of our business. We service traditional furniture retailers, hardware stores, garden and nursery centers, specialty merchants and a select list of online retailers. All of us here at Torrans Manufacturing Company, LLC take great pride in offering our customers only the best in vintage style lawn furniture meant to continue the tradition of informal backyard and front porch seating.